Distribution map of Lloyd's Mariposa cactus (Sclerocactus mariposensis). Lloyd's Mariposa cactus occurs in West Texas in Brewster and Presidio counties and also in the Mexican states of Coahuila and Nuevo León. A succulent perennial with waxy blue-green, solitary stems, which are usually 3-10 cm tall and 3-6 cm in diameter. The globose to cylindrical stems usually have 21 ridges that run more or less vertically and are divided into spine-tipped, cone-shaped projections. A dense cluster of spines arises from each projection, which completely hides the blue-green stem. Most of the spines (radial spines) form a ring around the tip, radiating outward and parallel to the stem surface. Other spines (central spines) arise interior to the radial spines and radiate somewhat outward and away from the stem. There are typically 25-32 straight, white to gray, needle-like radial spines, which usually grow 3-11 mm long. Two to four (rarely seven) central spines range from white to gray to light yellow to tan in color and have chalky blue gray, blue-black or brown tips. The lower central spine curves downward or sticks straight out from the stem and is usually 6-11 mm long. The upper central spine(s) (1-3, rarely six) points straight up or curves upward and is usually 13-20 mm long. Flowers of Lloyd’s Mariposa cactus are shades of pink, white, yellow, or green. The oval to round fruits are 10 mm long and, when dry, split open irregularly. The spines of Lloyd’s Mariposa cactus cluster so densely that they completely hide the blue-green stem. Flowers in the image are white, although the color can vary. Lloyd’s Mariposa cactus has 2-4 central spines that arise interior to the 25-32 radial spines. The illustration shows 32 straight radial spines, a single lower central spine (pointing upward), and 2 longer upper central spines. Credit: Patrick Stark - Texas Parks & Wildlife Dept. Without flowers, both silverlace cactus (Escobaria albicolumnaria) and Pott’s mammillaria (Mammillaria pottsii) resemble Lloyd’s Mariposa cactus. However, silverlace cactus is more cylindrical, taller (7.5-25 cm), and has a fleshier fruit. Silverlace cactus also has 10-21, white central spines, and 24-35, white, bristle-like radial spines. 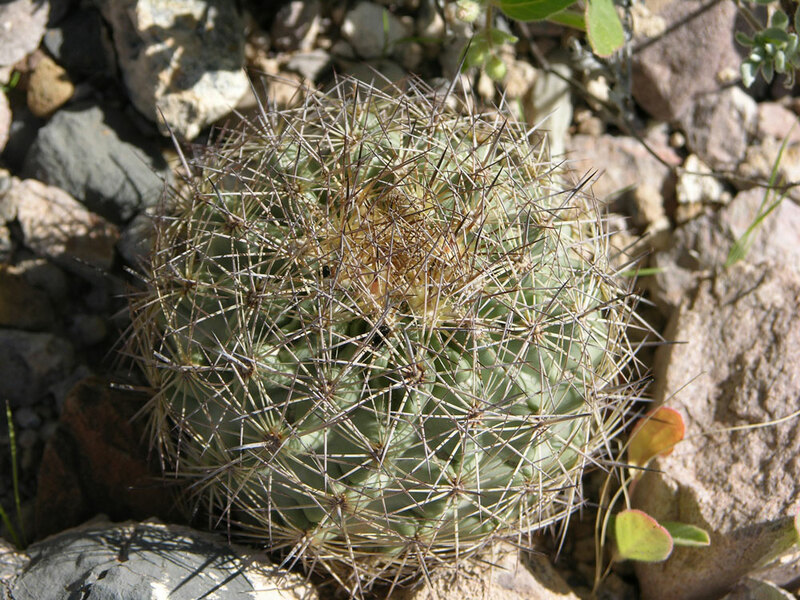 Pott’s mammillaria has clustered or often branching stems, usually 36-49 radial spines and usually eight central spines, small, brownish-red flowers, and club-shaped, fleshy fruit. Two other cacti, Warnock’s cactus (Sclerocactus warnockii) and long-central woven-spine pineapple cactus (Sclerocactus intertextus), are closely related to and occur in the same area as Lloyd’s Mariposa cactus, although neither have spines that hide the stem so well. 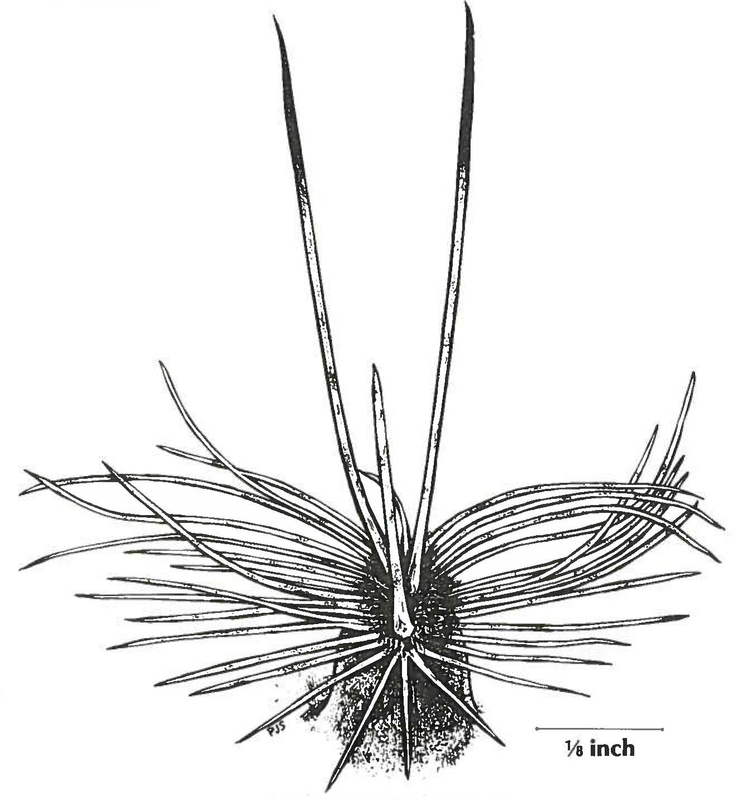 Additionally, Warnock’s cactus has 13 ridges on the stem, one central spine, and usually 11-15 radial spines. Long-central woven-spine pineapple cactus has green stems, and when the fruit dries, seed is released through holes near the base. 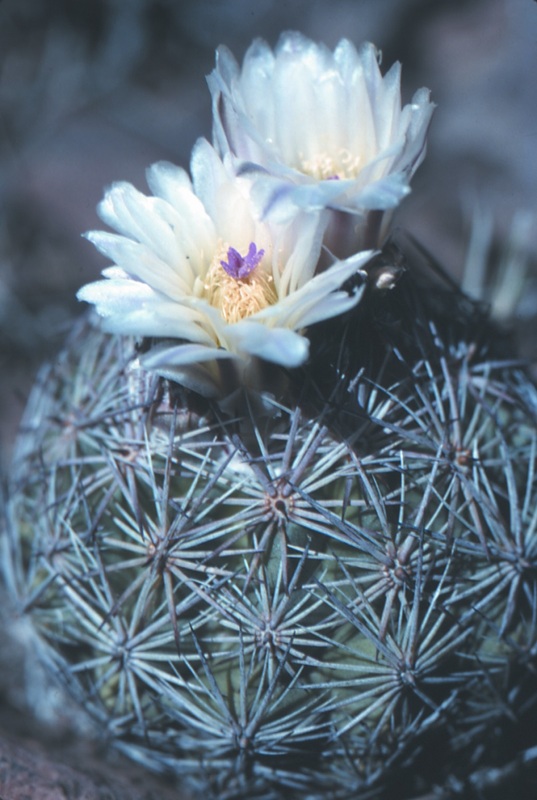 Silverlace cactus is more cylindrical and taller than Lloyd’s Mariposa cactus. 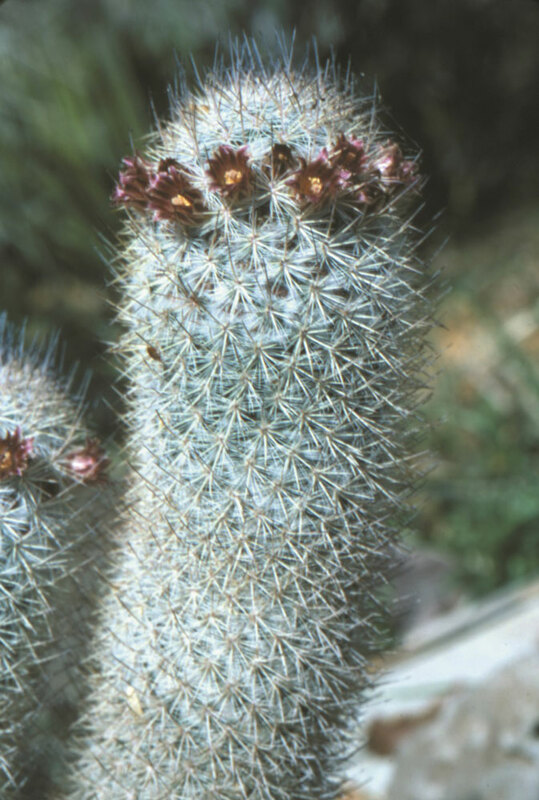 Pott’s mammillaria has small, brownish-red flowers. Long-central woven-spine pineapple cactus stems are green and can be seen through the 16-26 radial spines. 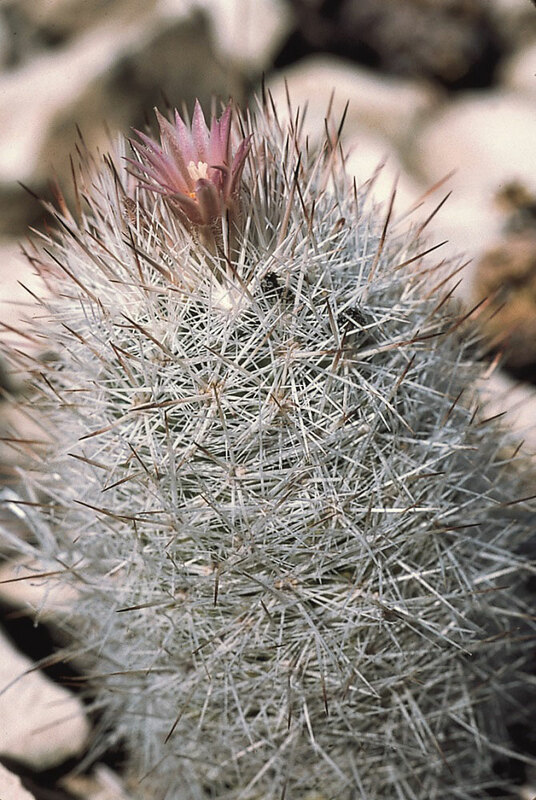 Warnock’s cactus has only 11-15 radial spines, which do not completely hide the stem. Lloyd’s Mariposa cactus occurs in Chihuahuan Desert shrublands on gravelly or rocky limestone slopes. Habitat of Lloyd’s Mariposa cactus. Flowering occurs from February to March, and fruits ripen 1-2 months later. Lloyd’s Mariposa cactus can be found year-round; however, it is more easily detected while in bloom in February and March. Lloyd’s Mariposa cactus (Sclerocactus mariposensis) gets its name from the Mariposa Mine, a cinnabar or mercury mine, near Terlingua. Due to decreased collection of wild Lloyd’s Mariposa cactus and the discovery of more populations, this species is more stable than previously believed. As Echinomastus mariposensis in: Powell, A. M. and J. F. Weedin. 2004. Cacti of the Trans-Pecos and adjacent areas. Texas Tech University Press. Lubbock, TX. McKinney, B.R. 2000. 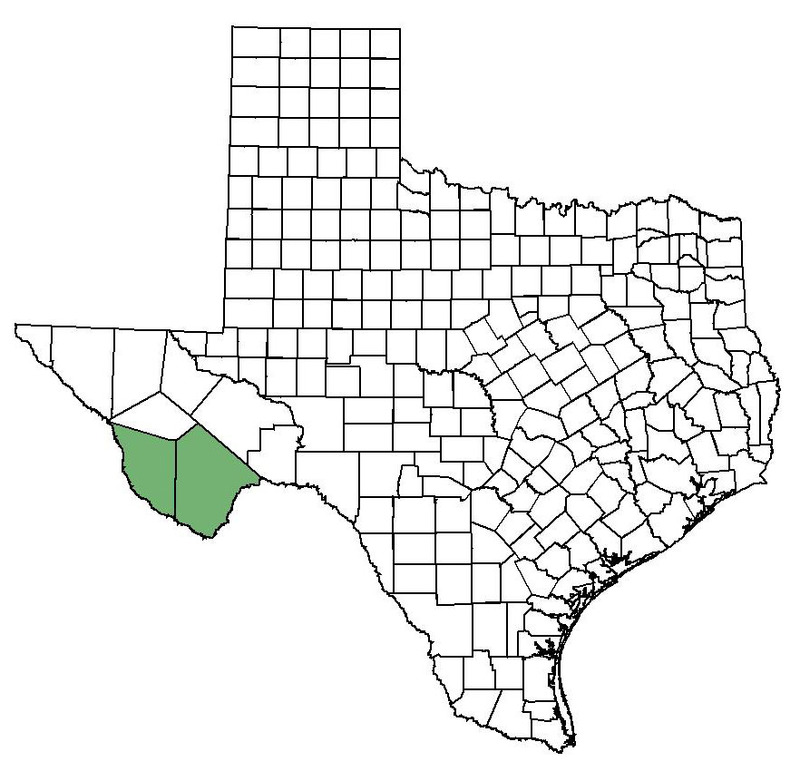 Rare plants, birds, mammals in the Trans-Pecos ecoregion of western Texas. Section 6 final report. Austin: Texas Parks & Wildlife Department.